Our range of products include high voltage tester and insulation tester. 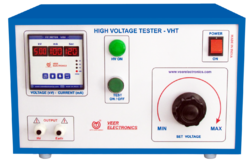 VEER Make High Voltage Tester is specially designed to test Dielectric Strength of Device under Test as per applicable standards. High Voltage Test is required to determine whether an insulating part has short or not. High voltage test is carried out as Routine Test. Each device is subjected to test at the high voltage of 1 kV + 2 × (working voltage). If Insulation is weak then the device will consume more power because of leakage current which causes more heat. Heat will reduce the reliability and overall life of device under test. It is also responsible for high risk and electric shock.We have exported our Instruments to More Than 26 Countries like USA, Colombia, UK, Belarus, Czech Republic, Germany, Italy, Poland, Romania, Spain, Switzerland, Turkey, Congo, Ghana, Saudi Arabia, Morocco, Zimbabwe, Bangladesh, Iran, Nepal, Pakistan, South Korea, China, Malta, etc. Note- 1. Above all Specifications are subject to change without prior notice, so please confirm at the time of placing Order. 2. *Size and Weight may be changed without prior notice for continues development. 3. These images are only for reference it may differ in actual Product. Note:- 1. Above all Specifications are subject to change without prior notice, so please confirm at the time of placing Order. 3. This images are only for reference it may be differ in actual Product.